Note: You can enter this giveaway one (1) time per e-mail address per day. Deadline is 11:59PM ET 12.27.18. A visually stunning exploration of Italy and its cuisine. America’s Test Kitchen and National Geographic have teamed up to bring you an amazing Italian experience. 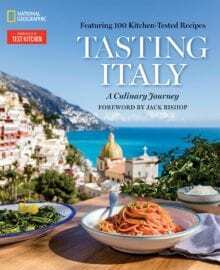 Discover the best of Italy region by region, through illustrated guides, informative maps, a gorgeous photographic array of the Italian landscape and, of course, 100 exceptional regional recipes. All tested and tried, so you know no matter which page you land on the food you make will amaze! To amaze your family and friends make this creamy and delightful chocolate hazelnut gelato. A little chocolate and a little hazelnut what could be more Italian than that. NO PURCHASE NECESSARY TO ENTER OR WIN. Void where prohibited by law. Open to legal residents of the 50 U.S., D.C. and Canada (excluding Quebec) who are at least eighteen years old at the time of entry and have internet access. Begins on 12.6.18 at 12:00 a.m. ET and ends on 12.27.18 at 11:59 p.m. ET. To enter this giveaway, submit your full name and email address on this form. Odds of winning this giveaway depend on the total number of eligible entries received. Only one (1) entry per email address per day. Sponsored by Leite’s Culinaria, Inc. For more information, visit our Official Rules. For a list of winners, check out our Very Happy Winners page. Be sure to add giveaways@leitesculinaria.com to ensure notification if you are the winner.